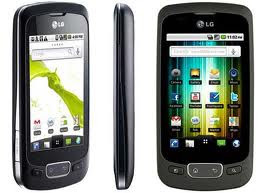 The P500 is LG’s attempt to conquer the affordable smartphone segment. At one point of time , the Korean handset maker was pumping out too many handsets into the market that we could barely keep track of. But over the last 1 year , the company has decided to launch fewer phones aimed at specific sections of the market. The Optimus One is one such attempt to fight back into the smartphone market. The specs of the phone look quite interesting considering the price point of the phone. In this review lets take a in-depth look at how LG has succeeded in delivering a great android phone. The first thing one would notice about the phone is the metal bezel around the phone which is mostly made of plastic. On the front you would find the 3.2 inch capacitive display sporting a resolution of 320×480 pixels.The display is not super responsive but it does the job . Seems like it’s made of plastic and not glass but we are fine with it. Below the display you have backlit keys for menu , home , back and search. The home and back button are slightly raised. LG thinks that these are the most used buttons and gave it special treatment – great move. Above the display you have the LG branding and the earpiece. 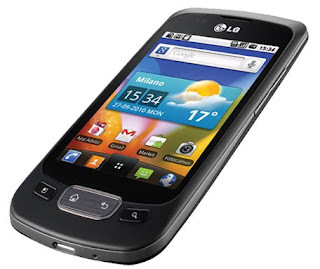 LG has gone for a slight user interface skin for the Optimus One, but it's only a minor set of visual tweaks and nothing like as intrusive and overwhelming as some other manufacturer's Android customisations. The Home screen has been slightly modified, featuring an HTC Sense-like curved docking area sitting at the bottom and shortcuts to the phone, contacts, apps, text messaging and browser. If you want to customise this little area, you can change those shortcuts to whatever by opening the app drawer, pressing menu, selecting 'move icon'; you can now drag your application to the bottom docking area if you happen to never bother with messaging. LG has put its own keyboard on here, inventively named the LG Keyboard. 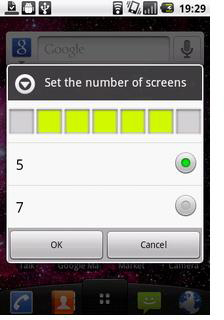 It's very similar to the stock Android keyboard, with numbers and special characters inconveniently hidden away on a second screen, which you access by pressing a key. The keys are needlessly tiny, making typing a bit of a chore. It's a poor effort, to be honest. There's a huge number of alternate keyboards out there on the Android Market doing a much, much better job of handling text input than either LG's option or even the standard Android 2.2 keyboard. 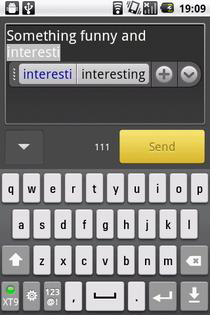 One thing LG offers that's of use is word prediction, which guesses what you're trying to type and pops the results up in a cramped little grey bar. It's a pretty ugly solution, but it does shave a few seconds off those important text messages about dinner and football. You also get the option of a traditional old mobile phone numeric keypad, complete with predictive text, just like in the old days. This is actually a better option if you remember your numeric typing skills, thanks to bigger keys that are easier to accurately hit than on the QWERTY layout. 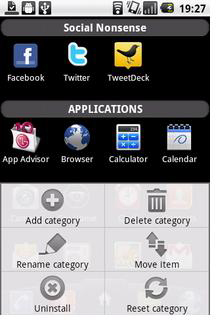 One of LG's more user friendly Android customisations is the addition of Categories to its app drawer. It's not actually that thrilling, simply giving users a a way to group apps by theme in the app listing. So if you want to bunch all your various Twitter apps or games together under one heading to make finding them easy, you can. It's a nice way to keep track of things and a clever technique to minimise scrolling fatigue if you're prone to filling up your phones with apps. The Optimus One also comes with a configurable selection of Home screens, in that you can decide if you want five or seven of them. It's nice to have the option, especially if you're not all that into widgets and find the full seven Home screens a little intimidating.